Source: CICH graphic created using a Statistics Canada custom data run of Taxfiler variables relating to families with children under 6 for each province and territory, for 2005 and 2010. In 2010, 33% of lone-parent families received social assistance. That was down slightly from 35% in 2005. 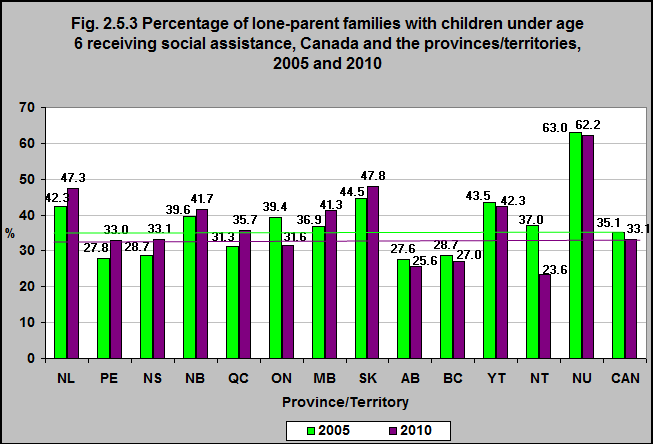 For both 2005 and 2010 the highest rates of lone parents with children under 6 receiving social assistance were in Nunavut and Saskatchewan and the lowest rates were in Alberta, British Columbia and the Northwest Territories (2010). 1Statistics Canada custom data run of Taxfiler variables relating to families with children under 6 for each province and territory, for 2005 and 2010.